Gisela Romero was referred to our employment training class (Nov-Dec 2017) through one of our community partners, Dr. Parker at Soul Church. 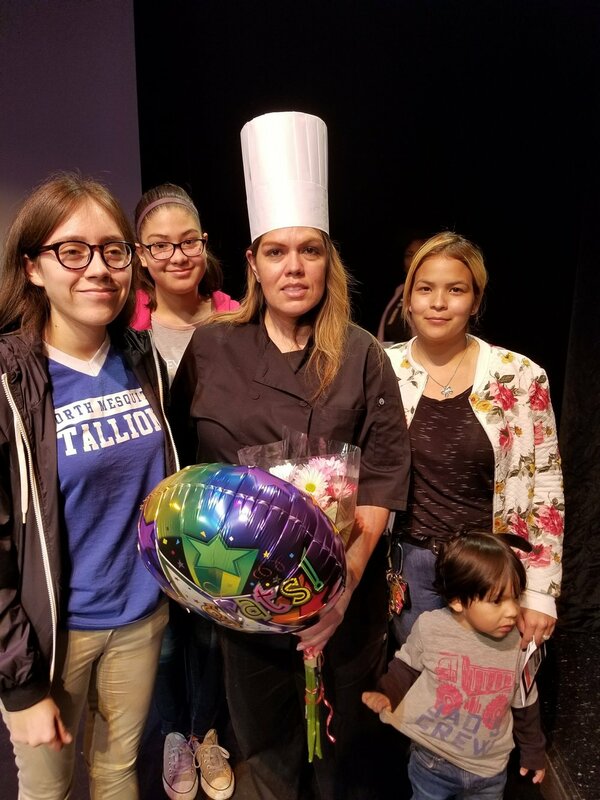 She had two friends from the church who had also graduated from our program, so she knew what to expect and was very “motivated” towards accomplishing her goal of culinary school. But first, Gisela had broken areas of her life that she needed to work through with the help of our Life Skills curriculum and meeting with a counselor, which is why she came to BridgeBuilders instead of going directly to CitySquare for their Food Service training. Despite being bright, articulate, and highly capable, Gisela had an obstacle in finding employment because of a blemish on her background report. This prevented her from becoming a permanent worker at Toyota and other skilled jobs. She turned her focus to starting her own catering business which was within reach if she could be trained and certified in the culinary field. Gisela loved being in class and interacting with staff and students. She took advantage of every resource that we offered and participated in everything! To her peers in class, she was supportive and encouraging. She was a joy and blessing for all of us to be around. Her final testimony when she left class was “Ready”. In Feb 2018, she graduated from CitySquare’s Culinary Training Program and has been hired at the Americano restaurant in the Joule Hotel. Additionally, she does part-time gigs as a server at parties and events to increase her network connections. She hopes to get some practical restaurant experience before she starts thinking about plans for her own catering service.